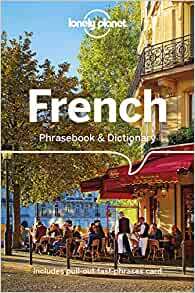 The Perfect Choice: Lonely Planet French Phrasebook & Dictionary , a pocket-sized comprehensive language guide, provides on-the-go language assistance; great for language students and travellers looking to interact with locals and immerse themselves in local culture. I have a number of these Lonely Planet phrasebooks for other languages, and they have all served me well over the years. So when my GF decided to travel to France on a vacation, i suggested this for her. I am fluent in French having lived there for many years, but she is not. I have been through this book and the sections are well laid out, and it is easy to find something useful to say in any general travel situation. There are pronunciation guides for every phrase, and it is equally easy to show the book to a native speaker to get them to point to a response to your inquiry if needed. The size of the book is perfect for a pocket, handbag, hipbelt etc. Anywhere you can stuff one of those new oversized phones will easily accommodate this book. I am in my 50’s and have 0 French background. I am desperately trying to learn on my own. I have purchased several audiobooks, workbooks, phone apps , kindle and hard copy books. It’s compact so it’s easy to carry . Glad I got it ! An excellent book and has many key phases! !